Figure A84. South Orkney Island anomaly, interpreted as the South Orkney Island slab, with (horizontal) [vertical] cross sections through (A)[D] the UUP07 p-wave) and (B)[D] the combined SL2013 and S40RTS s-wave models at 1790 km; C) the location of the modern geological record that we interpret to have formed during the subduction of the slab. 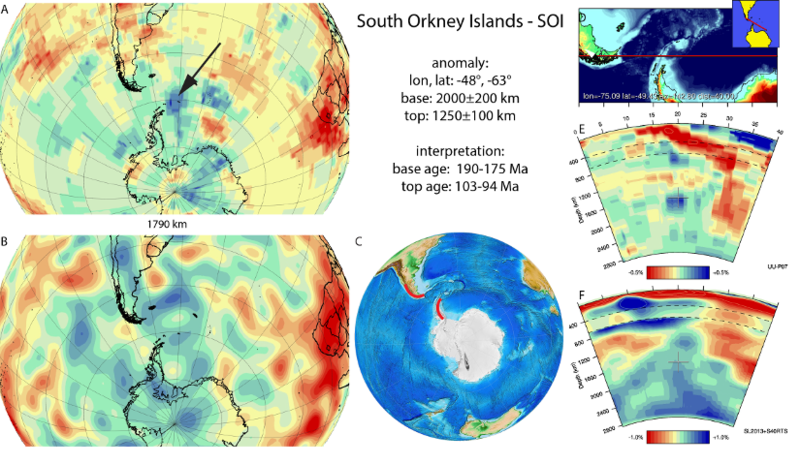 The South Orkney Island anomaly (Figure A84) is NW-SE trending and is located in the mid-mantle, from below southeastern Patagonia to below the Weddell Sea. Based on the shallower Scotia slab and the Georgia Islands slab to the east, it most likely represents paleo-Pacific lithosphere that subducted at the proto-Andean or Gondwanide margin. Martin (2007) interpreted break-up of the Gondwanide margin by slab rollback and back-arc basin spreading to occur from the Early-Middle Jurassic (190-175 Myr) to the Middle Cretaceous. Subduction rollback was terminated by the Palmer Land tectonic event in West Antarctica from 113 – 103 Ma and by the inversion of the Rocas Verdes/Magallanes Basin in Patagonia around 94 Ma (Vaughan et al., 2002; Fildani and Hessler, 2005), which we interpret to represent the end of the subduction of the slab.